I've always thought of life as divided into chapters of a story. There was being a a kid, high school, university, starting work, backpacking adventures, living abroad, meeting the love of my life, more backpacking adventures…and now being a mum. Little Wolfie (not his real name, but one that we did seriously consider before deciding that we really weren't cool enough to be those parents) appeared on the pages of our story a month ago - over two weeks early - and I honestly feel like we've had him forever. People tell you about the unconditional love you will feel for your child, and how much your life will change, and it turns out they're telling the truth. Who would have believed it?! I could never have imagined feeling this way. Even while I was pregnant, I was anxious about motherhood and what that would mean - not working, not having the freedom to do as I pleased, being 100% responsible for a small person every day and knowing exactly what to do. Every concern I ever had has vanished. I look at Wolfie and my heart feels like it will explode. He's the cutest thing I ever laid eyes on, even when he's screaming. I just can't believe how lucky we are to have him, and what a little miracle he is. And obviously he takes just after me. The perpetually hungry little man is happiest when he's eating, and he's been making sure his mummy is getting all the food she needs too - accompanying me out for steak, burgers, brunch, dim sum, pizza, mexican, seafood, and cake. Happy, happy days. 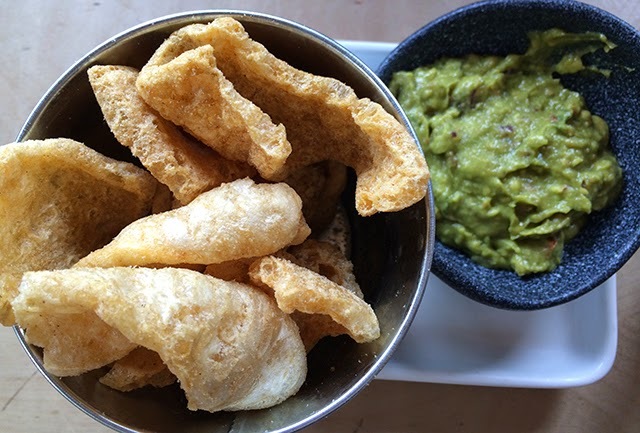 By the way, pork crackling with guacamole? Best. Idea. Ever. Sending you ALL THE CONGRATULATIONS!!! Glad little Wolfie is here safely and that you're still scoffing lots. Parfait. Are you sure you're not *those* parents? Nawwww wolfie is just the cutest little nickname ever :) I bet he's a right babe!